Tags: 2018 WSOP, Benjamin Moon. At the WSOP, there will never be a shortage of first times for anything and everything. Event #13: Big Blind Antes $1,500 NLHE, an event that was held for its very first time at the WSOP, had been bagged by Benjamin Moon, who was happy to take home his first-ever gold WSOP bracelet plus a sweet sum of $315,346 first-place cash prize, his reward for outlasting a total of 1,306 entries. Moon said, "I'm trembling, I'm just so excited! It's hard to explain. I only just started playing at the beginning of the year after taking a hiatus. Decided to try and go pro in October, playing the cash games in San Diego and then the tournaments in Los Angeles. Got a good start at the beginning of the year, since then cash has been going well and I decided to give it a shot here at the WSOP. And we're here now." The supposedly 3-day event actually took a fourth, extra day. Six players returned to the final day of play and Moon was a dominating force. Moon, who had never cashed in at the WSOP and therefore has never had a bracelet so far, now enjoys the limelight as he knocked out French poker pro Romain Lewis at a heads up match of 11 hands, and it was Moon holding the bigger ace against Lewis' straight and flush draws on the river. The big blind ante is a new format that the WSOP is testing this summer and Moon appeared very pleased about it, "I love the big blind ante. They do it in Los Angeles, all the tournaments I played there have mostly been big blind ante. So, it makes it way faster. There is only one negative if there was any. It's for short stack play, you seem to get punished more. Otherwise, it's great." 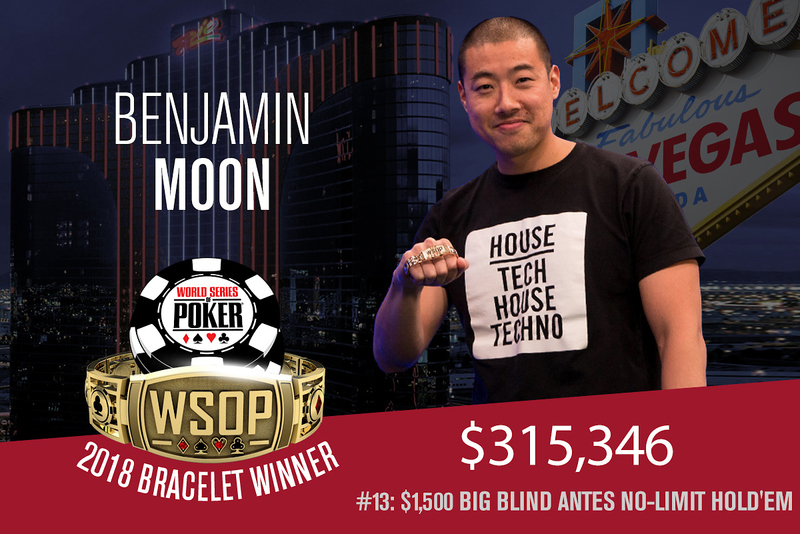 5 comments for "2018 WSOP: Event #13: Big Blind Antes $1,500 No-Limit Hold''em won by Benjamin Moon for $315,346"
its little bit different from normal no limit holdem,but again very good type of it and with nice buy in he got great first prize over 315K of $!so many different events every day and its everything for everybody!just that they dont spend this money in vegas very fast! Big congratulations to Benjamin Moon on being crowned champion of the $1,500 buy-in tournament. His surname is Moon, but he looks like Korean or Japanese. There are so many Asian Americans in the United States.